There is plenty of schmaltz at Sammy’s Roumanian Steak House on the Lower East Side. The stuff is served by the pitcher — in literal form, golden chicken fat — on the tables as a condiment. It covers the walls in the form of snapshots, clippings and tchotchkes left by appreciative customers. 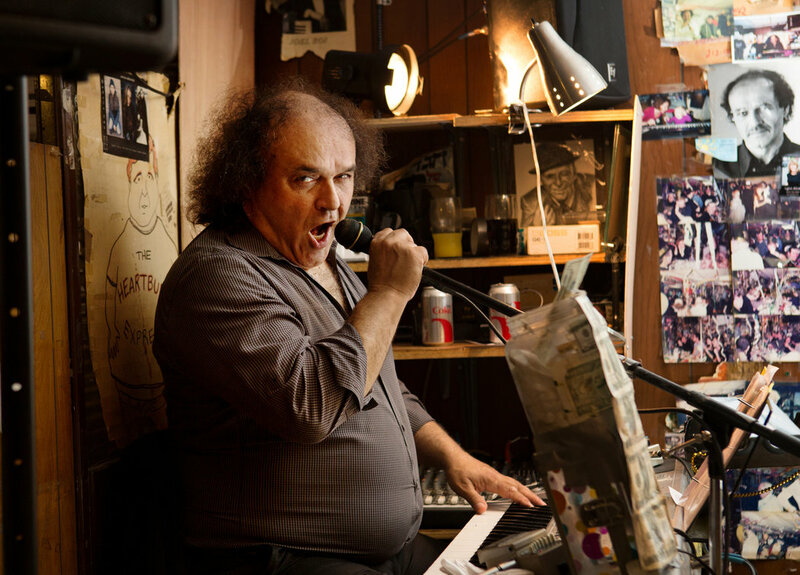 And it is in full effect over the sound system six nights a week, as Dani Lubnitzki, 56 and known at Sammy’s as Dani Luv, settles into the far corner of this quirky basement joint on Chrystie Street to deliver his repertory of tunes and comedy. For the past 15 years, Mr. Lubnitzki has fired up his keyboard and pumped out his shtick: a running monologue of borscht belt insult jokes, studded with obscenities and a musical matzo-ball soup of Jewish-themed tunes and standards and pop songs with ribald or Yiddish lyrics added. On Tuesday night, as the regular crowd shuffled in, waiters set beverages on the tables — seltzer in old siphon-top bottles and iced-down vodka — along with the baskets of pickles and rye bread, and the bowls of chopped liver. “They really come for the crazy Israeli,” said Mr. Lubnitzki, who was born and raised in Israel, picked up piano by ear and played in entertainment groups in the Israeli Army. He knows thousands of songs and says he was meant to work at Sammy’s. He began playing weeknights, but within five years he took over full time. “Mine is a destiny kind of story,” said Mr. Lubnitzki, whose personality is as unrestrained as his wild head of hair. He slipped into the bathroom and changed from his T-shirt to a dress shirt, partly unbuttoned to reveal his hirsute chest. He climbed onto his high stool behind his aging keyboard buttressed by duct tape, wires stretching everywhere. To his right was a tip jar adorned with images of $100 bills as suggestions. Above was a small disco ball wired to the faded dropped ceiling. “Welcome to Sammy’s, the house of cholesterol,” he said to the diners. “Even the shiksas and goyim, we hope you all enjoy,” he said, using Yiddish slang for non-Jewish women and men. With a punch of a button on his schmaltz machine, Mr. Lubnitzki can go from Yiddish folk songs to an impeccable imitation of Louis Armstrong, which he performed Tuesday night, complete with scatting and a buzz-lipped simulated trumpet solo. “I have to play my own trumpet, because I work in a Jewish place with no budget,” he said. The Israeli piano man played “As Time Goes By” — “A bris is still a bris” — and then “It Had to Be Jew.” By now, he was swigging vodka from a water glass. “Sorry about the small portions,” he said, as waiters brought out huge steaks and stuffed cabbage. When one waiter delivered a bowl of chicken liver and began mixing in the onions, Mr. Lubnitzki played a frantic saber-dance melody and urged the waiter to “Get on the ball” and mix faster. He bantered with the customers, teasing a female cantor at one table and ribbing another table celebrating a young man’s graduation from law school. “Ah, I’ve sung this song two billion times, enough to make me cut my veins already,” he said on a break. Still, it brings in the tips. There was the Russian man a few years back who tipped him $400 for four minutes of the tune. Mr. Lubnitzki, who also plays private engagements, said that if he ever left Sammy’s, he would train his replacement, which could take years. Because of an editing error, a picture caption in some editions last Sunday with the Character Study column, about Dani Lubnitzki, who entertains at Sammy’s Roumanian Steak House on the Lower East Side, misspelled part of his nickname. As the article correctly noted, he goes by Dani Luv, not by Danny Luv.